Thinking about baby safety doesn’t necessarily come naturally to parents and, in fact, might seem like yet another overwhelming and intimidating task related to bringing up baby. Fortunately, babyproofing is something parents can–and should–take care of before baby even arrives, when you do not yet have the day-to-day care of a new infant as your first priority. You might consider it as the warm-up before the big game–a time to get into the right mindset for parenting and get comfortable with your equipment and strategy. Like many things, you should rely on instinct, but here are some general guidelines to help you make your home a safer place for your bundle of joy. A new infant, though not mobile, requires safe equipment (car seats, cribs, strollers,monitors). 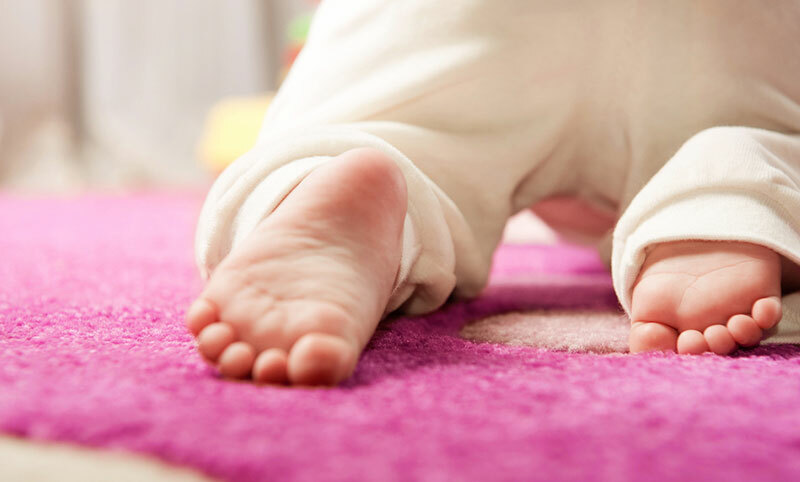 Once a baby can push herself up on her hands or roll over (around 3 to 6 months), you will need to make sure there is nothing within her reach in or above the crib or on a playmat that may be hazardous. When a baby learns to creep or crawl (around 7 to 9 months), the area in need of babyproofing expands exponentially. You may have to develop babyproof “zones” in highly frequented areas of the home–rooms that are safe for baby and are blocked off from the rest of the home by gates or other equipment. Staircases now become a hazard, and some experts suggest that the bathroom and kitchen should be completely off-limits to mobile children, due to the difficulties involved in making those areas safe for baby. A walking child can get much farther than a crawling child and can do so much faster. At this stage of the game (around 10 to 14 months) you will need to be especially vigilant about watching your child and making sure off-limits areas are well guarded by gates or other barricades. An upright child can also reach much higher than a crawling toddler, so the area that must be babyproof expands vertically as well as horizontally. “Better safe than sorry” is the best approach to adopt when it comes to making your home a safer place for your baby. The best way to assess what could pose potential hazards for your child is to see your home from a child’s point of view, quite literally. Start by getting down on your hands and knees and explore your home from that vantage point. When you view things from this perspective, it will probably become quite obvious to you just how dangerous that coffee table corner is or how easy it would be for a baby or toddler to stick curious fingers into an electrical socket. Below is a checklist of things you should do in every room in your house. Use socket guards for all unused electrical sockets. Use safety locks on all windows. Put coins, keys, matches, batteries, paper clips, ashtrays, purses, and other small items out of your child’s reach. Place safety latches on all cupboards and closets. Install smoke detectors in all sleeping areas. Use corner cushions to protect your child from sharp corners. Use cord shorteners to avoid exposure to window cords and wires in the house. Secure gates at top and bottom of all stairways. Eliminate baby’s access to the bathtubs, showers, toilets, swimming pools, and hot tubs. Make sure cosmetics, perfume, aftershave, and other toiletries are out of reach. Position pet food and the litter box out of baby’s way. Post the number of your local poison control center next to telephones along with a list of other emergency numbers–such as the ER, pediatrician, grandparents and other close relatives, and neighbors. You can print our fridge sheet of useful numbers. Stow cleaning products, paint, electrical tools, and exercise equipment out of baby’s reach. Keep plastic wrap and plastic bags out of baby’s reach. Place knickknacks on a high shelf. Use a fireplace screen that a baby cannot tip over, store fire utensils and matches out of baby’s reach, and cushion the corners of fireplace edges with padding or guards. Cushion the edges of tables, desks, or other furniture with padding or guards. Do not hang mobiles or other toys over the corner or sides of a playard once baby can push up on her hands, as this could present a strangulation hazard. To prevent your toddler from hurting themselves climbing into or out of a playard, don’t leave them in a mesh playard with the drop side down, and keep the drop side of a playard up even when your child is not in it. Do not leave children unattended in a playpen. Do not use use a playard with holes in the sides, as this could entrap a child’s limbs or head. Avoid locking mechanisms on toy chests that could lead to pinched fingers or accidental closures. Keep the toilet lid down and secure it with a latch and do not allow children to play with the water in the bowl. An open toilet bowl presents a potential drowning hazard (not to mention a germ hazard). Do not leave water in the bathtub when it is not in use. Children can drown in as little as 2 to 3 inches of water. Do not leave a child unattended in the bathtub or rely on an older sibling to supervise. Use nonskid mats in the bathtub to prevent slipping. Check to see that the suction cups on a bath seat are securely attached to the bath seat and tub surface. Never use the baby bath seat in a non-skid, slip-resistant bathtub because the suction cups may not adhere to the bathtub surface. Do not rely on bath seats to keep baby safe in the bath. Keep the medicine cabinet locked and keep all medications in childproof containers. Move all soaps, shampoos, bath gels, razors, and other toiletries out of reach of children. Before placing your baby in the bathtub, make sure you have everything you need to bathe your baby near you to prevent having to turn away from baby to fetch it later. Test the temperature of the water before bathing your baby by using your wrist or elbow, and remember that babies may not be able to tolerate the same water temperature as an adult. The correct temperature should be between 96 and 100 degrees Fahrenheit. Place soft or inflatable covers over tub faucets to prevent bumps and bruises. Always use all restraining straps provided on a highchair–both the waist strap and the strap that goes between the legs. Injuries or even strangulation can occur from unrestrained children slipping down under the highchair tray. Make sure that the locking device on a folding highchair is fully engaged. Don’t allow your child to stand up in a highchair or an older child to hang onto a highchair while baby is in it. Place the highchair far enough away from the table, counter, or wall to prevent the child using that surface to push off and tip the chair over. When seating a child at a table, use place mats instead of tablecloths, in case they succeed in pulling the tabletop items off the table. Add sharp knives to place settings only after adults are seated. Use plastic plates and glasses for children. Be sure that your china and silverware are stored away from your baby’s curious grasp. The kitchen, like the bathroom, is full of potential hazards. It may be best to block access to the kitchen with a safety gate. Never leave babies or toddlers alone in the kitchen. Do not let your baby play on the floor by the stove while you are cooking. Use the back stove burners when possible. When using the front burners, turn the pot handles toward the back of the stove so that children cannot grab them. Install cabinet and drawer latches and locks to prevent your child from finding items that may present a choking hazard. Keep all dishwashing liquids and cleaning agents in locked or latched cabinets. Keep sharp and potentially dangerous items out of reach. When your baby starts to crawl, explore, or use a walker, it’s time to install gates wherever potential hazards may be present around your home. At the top of stairs, at the bottom of stairs, and in between rooms, safety gates act as barricades that communicate which areas are off-limits for your little scooter. When purchasing gates for your home, there are several things to keep in mind: types of gates, features, and safety. We recommend you check our complete guide to choosing safety gates for your home.